This bookcase is a simple, sleek storage and display bookcase for your home office. Three sizable shelves and two lower drawers provide bookshelf and file storage for your home office. Completed in a rich espresso finish this bookshelf pairs perfectly with the coordinating open bottom bookshelf for a storage wall unit. The Fulton KIH Bookcase with Lower Doors by kathy ireland Home by Martin at Reeds Furniture in the Los Angeles, Thousand Oaks, Simi Valley, Agoura Hills, Woodland Hills, California area. Product availability may vary. Contact us for the most current availability on this product. Finish Our finishing process uses up to 18 steps to produce clear, durable finishes that enhance the beauty of natural wood grain. Handles & Hardware Burnished knob and handle pull hardware. 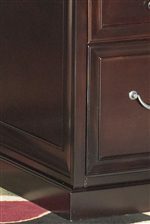 Drawer / Shelf Construction With precision channel, dovetail drawers, and ball-bearing glides our furniture drawers are built to withstand the test of time. Drawer Suspension Ball bearing drawer glides have commercial quality, quiet operation, and support heavy loads. up to 50 pounds. Construction: Case Hardwood solids and real wood veneers are hand-laid with great attention to detail to consistently produce beautiful furniture. 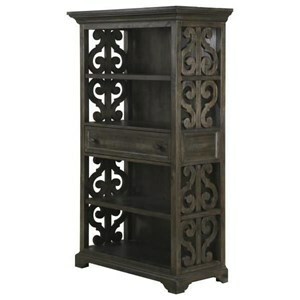 Craftsmanship and artistry skills combine to produce details such as hand-rubbed patina finishes and elaborate patterns. Inspired by the Architectural Style Guide, the Fulton home office collection is a soft modern collection that blends traditional design elements like crown molding and picture frame detailing with contemporary influences like clean lines, stained nickel hardware and a rich espresso finish. Bring the best of both design worlds in to your home with the Fulton home office collection, a true design solution for living. The Fulton KIH collection is a great option if you are looking for Traditional furniture in the Los Angeles, Thousand Oaks, Simi Valley, Agoura Hills, Woodland Hills, California area.